This ravioli comes with a surprise. At first bite you taste the Alfredo sauce. However, as you chew you get a second burst of flavor—the chicken flavored with pesto. That one-two punch of flavors makes this dish surprisingly delicious. For the ingredients below, plan on each egg feeding 2 people. Multiply the recipe for more dinner guests or for larger serving sizes. Combine one egg with the salt, blending well. Start adding the two kinds of flour, a couple tablespoons at a time, until the mixture becomes a dough that can be kneaded. More or less flour might be needed, depending on the size of your eggs; therefore, add flour a little at a time until the dough is dry enough to knead. Knead the pasta dough until smooth. Wrap in plastic and store in the refrigerator for at least an hour—longer is better. The dough can be stored up to 24 hours. While the dough is resting, prepare the filling by mincing the chicken breast meat fine. Add the pesto and blend well. Cover and store in the refrigerator until needed. Prepare the sauce by combining the flour and butter in a saucepan over medium heat, making a roux. Cook the mixture about a minute, then add the milk or half and half. Combine well and bring to a gentle boil. Reduce the heat to low and cook the sauce, stirring constantly until thickened, up to 10 minutes. Remove from the heat and gently stir in the cheese and parsley. Do not over-mix or the cheese could become stringy. It only needs to be combined. Taste and adjust for salt. Set aside. Roll the pasta dough into thin sheets. Arrange small mounds of filling along one side of the sheet with room in between. Lightly beat the remaining egg with a fork, adding about a teaspoon of water, to make an egg wash. Using a pastry brush, lightly coat the opposite side of the pasta sheet with egg wash and then carefully fold the pasta sheet over the filling, pressing to seal the two layers together well. Try to squeeze out air as you fold over the pasta dough. I find the easiest way to do this is to brush egg wash onto only about 2/3 of the dough to be folded over, coating the dough near the mounds of filling and leaving the final third uncoated. After folding over the dough and squeezing out air, I brush egg wash between the layers, coating the pasta that was left uncoated, and then pressing together to create the final seal. An alternative is to brush egg wash around the mounds of filling, leaving the edge uncoated. Fold over the pasta dough, squeezing out air, and then brush egg wash between the layers. Press the two layers together to seal. Heat plenty of water to boiling in a large pot. Add the ravioli, return the water to the boil, and then cook for only about a minute. Either drain in a colander or use a “spider” strainer to remove the cooked ravioli from the water. While the ravioli are cooking, heat the Alfredo sauce. 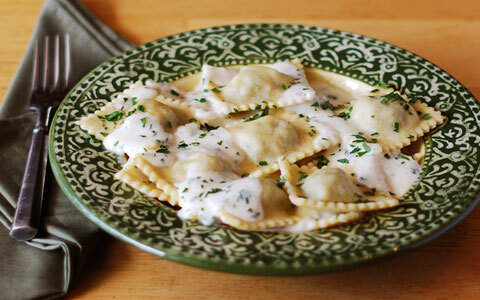 Plate the ravioli. Coat with Alfredo sauce and garnish with chopped fresh parsley, if desired. Serve.